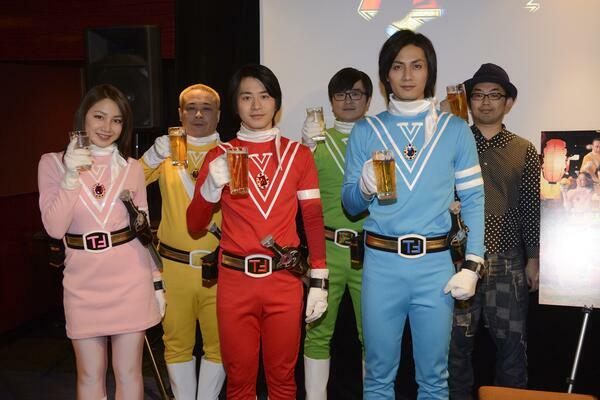 Ryouta Murai (Kamen Rider Decade’s Kuuga) and Kazuki Kato (Kamen Rider Drake) sat down with Sumabo.jp to talk about the upcoming alcohol themed Kanpai Senshi After V.
They revealed that the whole series was shot in 3 months, during which the main cast worked together almost daily. The series will not feature any fight scenes, the plots revolve around the heroes having a drink and bickering amongst themselves. The filming locations were primarily izakayas and karaoke boxes, including Akihabara’s NIJYU MARU izakaya and Ginza’s “Karaoke no Tetsujin”, both of which are famous chain establishments. Kato shared similar feelings too, “I told my manager ‘I definitely want to do this‘ as soon as I read the script. I wanted to know what happened next so badly (laughs). Then when I was cast as Blue, and I already knew Ryota would be in it and who the other members were, I just knew it would be hilarious. The group readings were hysterical. My gut instinct was right”. “Changing the scenario from a group of heroes to a regular office can multiply the fun”. When prompted about having to transform and save the day, Murai went onto say “There are even robot fights. But since those are done during the day, after the job is done we are like “Good job!” and go to an izakaya”. The villains are far more serious about their jobs than the After V team. They are very passionate about destroying the world, compared to the heroes who lack motivation and drag their feet, looking bored. The script incorporates both jokes about Sentai tropes and about the salarymen of today. The team resemble Sun Vulcan because the director viewed it in as a child when it originally broadcasted on television. The show is, of course, not meant to be seen by children. As Murai puts it: “Just tune in after you come back from work and make fun of these grown ups doing silly stuff.” Kato followed this with “The show is full of memorable quotes and we would like the viewers to enjoy the silliness in each”. The story will follow the five members of Golden Warriors Treasure Five as they fight day and night against an evil organization. This is a comedy drama portraying their bonds and true feelings while having a beer after a battle. 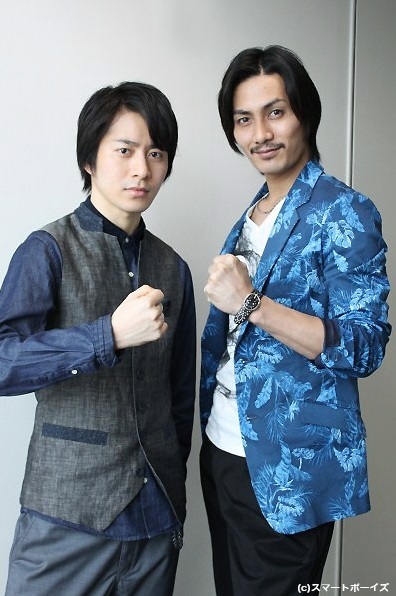 Filming for the series took place in and around Akihabara and features Murai Ryota (Kamen Rider Decade) as the red warrior along with Kato Kazuki (Kamen Rider Kabuto, THE NEXT) as the blue warrior. 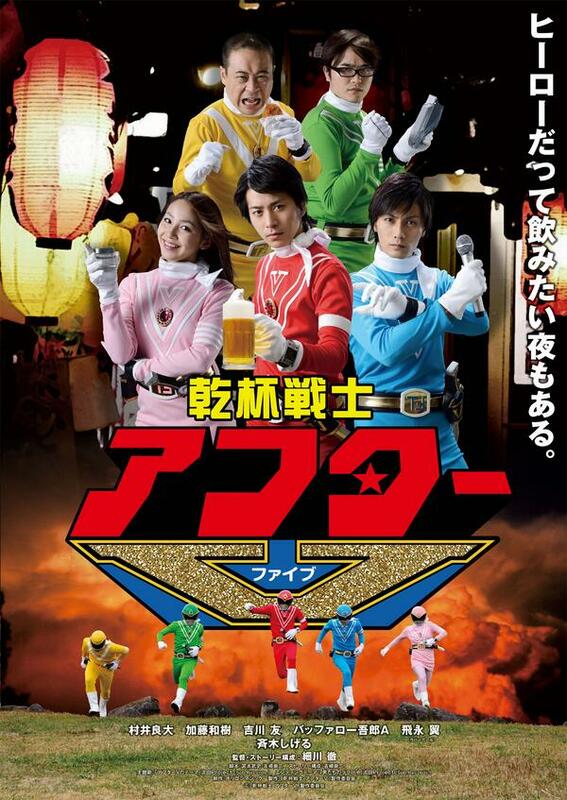 Kikkawa Yu will played the pink warrior while Buuffalo Goro A will play yellow and Tobinhaga Tsubasa will play green. The series will begin its broadcast April 7th. All English translations are accredited to The Tokusatsu Network staff members. Please do not repost without crediting and directly linking back to the original Tokusatsu Network article. Translator and interpreter among other things. A not so engaged yet passionate tokusatsu fan.